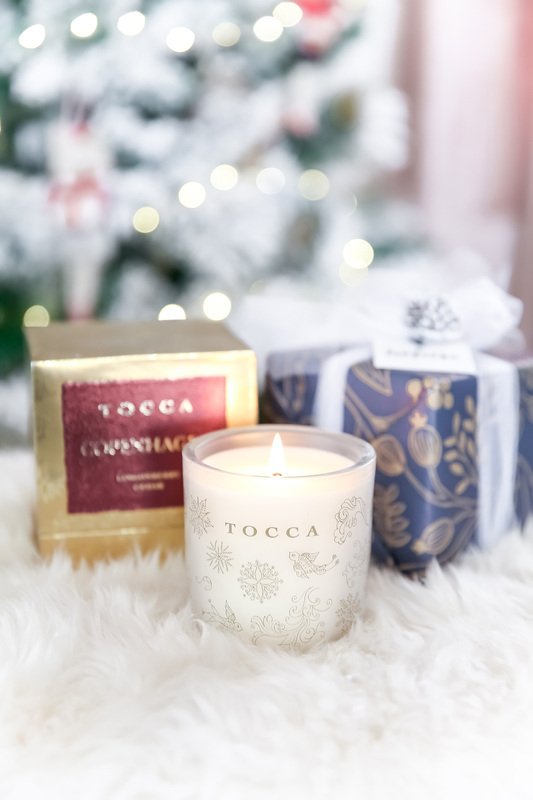 Whether you are shopping for holiday candles for yourself or gifting it to someone on your list, here are a few of my favorite luxury picks. 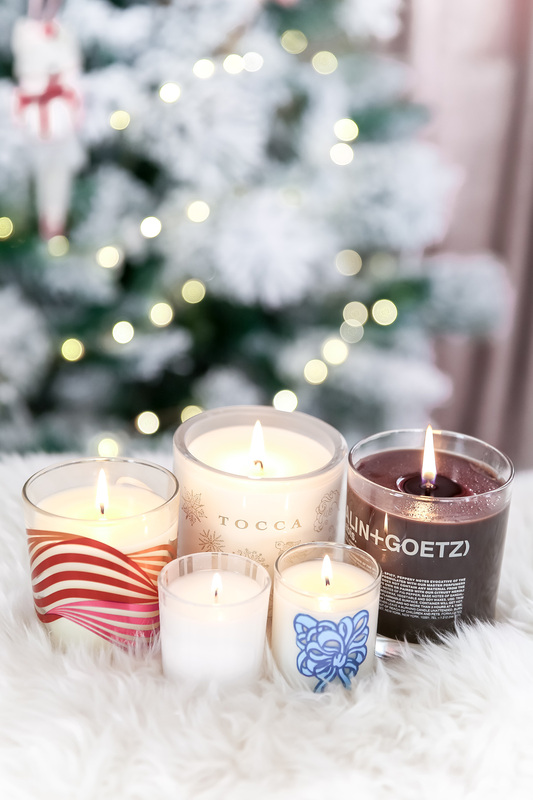 There’s nothing quite as cozy as candles during this season. Hygge! I personally am enjoying the below with two more on the way. Of course, most of you already know Diptyque and Jo Malone London, so I don’t need to cover them. Just in case you were wondering, I have THIS and THIS in the mail. Yay! Wait, did I tell you I got to meet THE Jo Malone last week?! She has a new line of fragrances called, Jo Loves. It’s highlighted on my Instagram Story HERE. Here are some more luxury candles to enjoy this holiday. 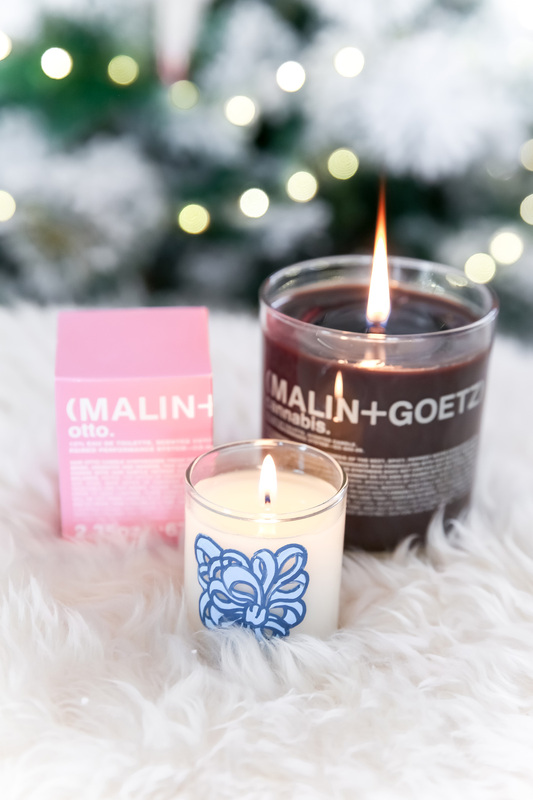 Keep reading until the end for my Malin+Goetz candle giveaway!! First, look how pretty it looks! 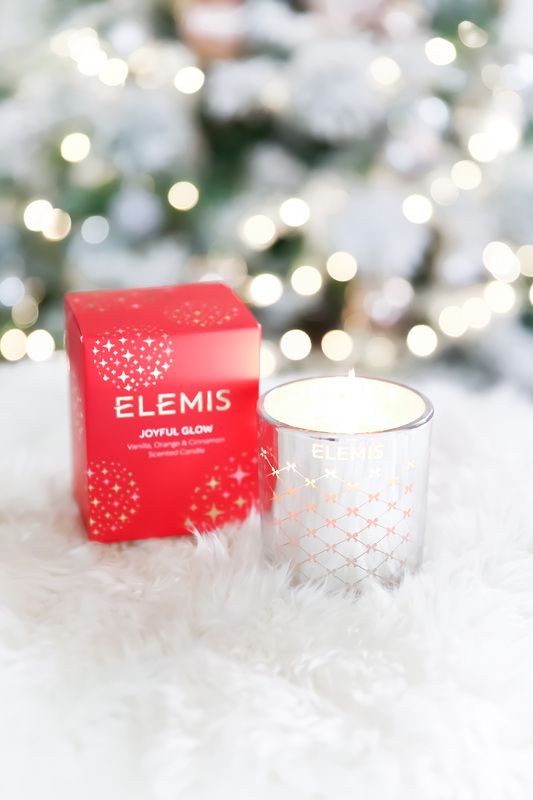 Elemis is a beauty brand (and spa!) I’ve loved for a few years, so no doubt their candle will make it in this post. The Joyful Glow scent is like a hug — vanilla, orange and cinnamon. The metallic decorative glass matches my winter wonderland theme this year and looks great placed anywhere. I’m a little obsessed with the holiday voyage collection, featuring three destinations (scents). The packaging looks so good. Besides Copenhagen (Lingonberry/Cedar), I love Chamonix (Rosemary/Pine), and have it ready wrapped to gift to one of my best girlfriends. The last one is Tahoe (Nutmeg/Vanilla) — which is so comforting. P.S. I love Copenhagen because it reminds me of my trip there. Travel diary can be found HERE. I love the fact that Space NK came out with its own exclusive candle! It’s such a warm and inviting scent of cinnamon and spice with citrus notes. Just think mulled wine. Yum and yummier. Now we’re moving onto, favorite scents not exclusive to holiday. Sometimes I like to take a break from burning warm smells to cooler ones. Kind of like a palate cleanser for your nose. 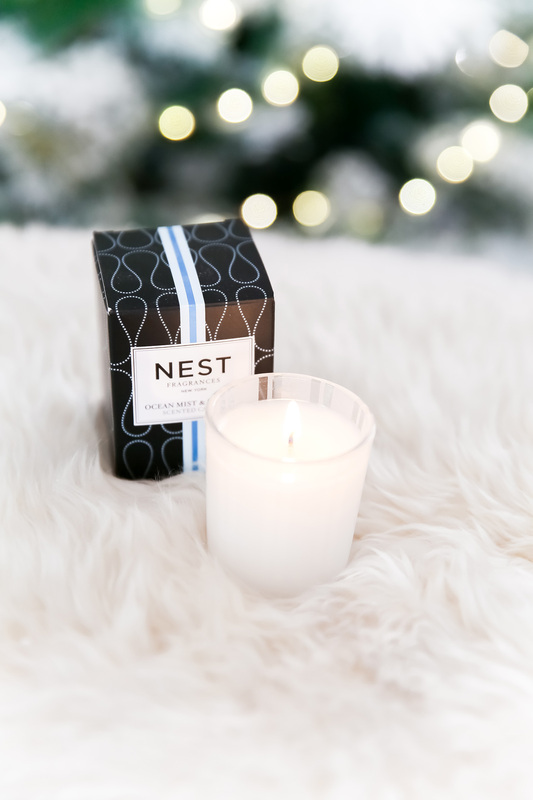 I love clean smells like this one, but if you want to give some of the Nest holiday scents, look HERE and HERE. This is currently my favorite scent from M+G. If you love complex floral smells, then this one is for you, too! Cannabis is also burning here, as it is one of their newest launches — deep and herbal. I also highly recommend Dark Rum, M+G’s best seller. It was the first one I’ve burned from them. My favorite holiday activity is baking cookies and breads. I love Sugar cookie scent! I love the smell of cinnamon, especially during the holiday season. I like vanilla the most. I love anything that has vanilla or chair kind of scents, and one of my favorite winter activities is lighting a bunch of candles and curling up with a cup of tea and a good book to enjoy them! My favorite holiday scent is gungerbread. Reminds me of growing up baking cookies with my grandma! Bayberry, I think, is my favorite scent for the holidays…. evergreen and sweet! I love pomegranate and coffee scents. My favorite holiday scents are fir and cedar. I like an apple pie scent. I like the smell of pine. I love the smell of baked apple pie! Yum! My favorite holiday scent is balsam, I love the smell of Christmas tree and this comes closest. I love sugar cookie! Smelly Yummy. ELEMIS would be my choice! I love the naturey scents like the woods and trees. I absolutely love the scent of pine trees. My favorite holiday scent is balsam. I love the smell of pumpkin pie! And vanilla! And Cinnamon! I love the scent of baked goods. Cookies, apple pies. They make me think of the comfort of home. I love making snowball cookies on Christmas Eve. I love the smell of fresh cut Pine. My favorite scent is Peppermint! Any of the tree scents are winners for sure, such as balsam, fir, and evergreen. They remind me of my childhood Christmas. My favorite holiday scent is Pumpkin Spice. My favorite holiday scent is pine. My favorite holiday activity is driving around to look at Christmas lights. My favorite scent is Apple Cinnamon as well as Pine scents. one of my favorite activities is making coquito. we use light rum, and its pretty good. My favorites are lavender and vanilla. My favorite holiday scent is Cinnamon and vanilla! For the holiday, I love vanilla scents! Cedar is my favorite holiday scent. I like anything with cinnamon and vanilla! I enjoy spicy scents like sandalwood, cinnamon, and nutmeg.